Rabbi Chaim Rapoport has recently published a revised and expanded edition of The Afterlife of Scholarship, his critique of The Rebbe by Heilman and Freeman. R. Rapoport has gathered much interesting information and analysis, expanding and reorganising his detailed arguments, and also summarising specific elements of the debate that was played out between him and the authors of The Rebbe on the Seforim Blog (see here, here and here). R. Rapoport has also included an appendix entitled The Ten Lost Years (1941-1951) detailing the role the Rebbe played in the Lubavitch movement following his arrival in America, and the more controversial issue of his rise to the leadership of Lubavitch following his father-in-law's passing. Large parts of the newly published work can be viewed via Amazon's "Look Inside!" feature. In Afterlife of Scholarship, Chaim Rapoport offers a meticulous critique of Samuel Heilman and Menachem Friedman, The Rebbe: The Life and Afterlife of Menachem Mendel Schneerson, published by Princeton University Press, 2010. Rapoport challenges many of the assumptions made by Heilman and Friedman, and argues, through close textual reading, that these assumptions are based on interpretive flaws and/or lack of knowledge of Hasidism in general and of Habad in particular. Despite the overtly polemical tone, Rapoport's criticisms are never offered ad hominem. On the contrary, he painstakingly documents every point of contention, and has thereby provided ample evidence to allow other readers to assess his arguments against the portrait of the Rebbe presented by Heilman and Friedman. Whatever one might decide on the merits of his analyses, Rapoport's volume provides an invaluable treasure-trove of sources for future generations of scholarship on the seventh Rebbe of Habad-Lubavitch. Over at the Talmud Blog there's a discussion about the medical advice offered by the Talmud. I am reminded of a discussion in Lekutai Sichot (Vol. 23, pages 33-41) by the late Lubavitcher Rebbe, Rabbi Menachem Mendel Schneerson זי"ע, which sheds some light on some of the more general issues raised there. The central problem he seeks to address is that Maimonides included some (but certainly not all) of these Talmudic cures in his Mishnah Torah, codifying them as a part of Jewish Law, despite the fact that he only includes laws that are pertinent for all generations in that work (see Lechem Mishnah, Hilchot Talmud Torah 4:1, Sdei Chemed Vol. 9, Klolei Haposkim 5:11). At the same time he is clearly acknowledging that they are not eternally relevant by only including some Talmudic cures. The source cited in Part One, associating Mendelssohn, Wesseley and Satanow with various levels of Klipah, is an example of antagonism directed towards Mendelssohn from the Chasidic camp specifically, and it seems quite clear that the Non-Chasidic Traditionalist contemporaries of Mendelssohn did not necessarily see him in such a negative light. Moses Mendelssohn is widely acknowledged as one of the great Jewish thinkers whose ideas marked the progression of Modern Jewish thought. However, the image of the man in his own time and his legacy thereafter, continue to mystify. Despite his almost legendary fame, there is no modern stream of Judaism that traces its roots back specifically to his worldview or labels itself "Mendelssohnian". On the other hand, it is clear that he and all others associated with the early Haskalah (Enlightenment) movement, have been generally disassociated from Orthodoxy. Relative to the great Jewish thinkers of the nineteenth century, Mendelssohn is more likely to be associated with Abraham Geiger and other reformers than with Orthodox figures such as Samson Raphael Hirsch or Esriel Hildesheimer. By all accounts, however, Mendelssohn was a strictly observant Jew who championed the validity of the ritual component of Jewish law as Divinely mandated by the authority of the Revelation at Sinai. If so, it would seem that the differences between Mendelssohn and Hirsch, are less significant than those between the former and Geiger, for example. To be sure, Hirsch was a Rabbi with a beard, while Mendelssohn looked and lived the part of a renaissance man of letters. But their attitudes towards Torah and modern society don't seem to be so fundamentally different. There certainly are differences, but apparently they relate more to semantical aspects of Jewish thought than to the fundamental tenets of belief. Both attempted to draw Judaism into the modern world, championing the causes of general education and integration into secular culture, without compromising on Jewish law and practice. In a lengthy discourse (Lekkutei Dibburim Vol. 1, page 164), Rabbi Yosef Yitzchak dispels the sense of helpless and arbitrary insignificance normally conveyed by the ‘leaf in the wind’ metaphor, and in its place builds a model of elaborate providence. The image is now used to exemplify an irreplaceable component in a carefully ordained plan; a grand design in which each and every created being is endowed with its own unique significance relative to its station. The millions of small events, apparently swept together at random by the great gusts of world shaking events, are in fact precisely ordained, designed to fit together like the pieces of some great puzzle. There is nothing which is not a priority. When applied to the story of Rabbi Yosef Yitzchak’s life, this model fits like a glove. Some of the most earth-shattering milestones of modern history; the social and political upheavals that began to plague Tsarist Russia at the end of the nineteenth century, the First World War, the Rise of Communism, and the Second World War, swept Rabbi Yosef Yitzchak from the provincial village in white Russia where he was born, to the tottering grandeur of Tsarist St. Petersburg, to the darkly secretive silences of communist Leningrad, to Riga, the Holy Land, Warsaw and ultimately to New York. Another may have seen himself as a helpless leaf, powerless in the grip of such powerful winds. 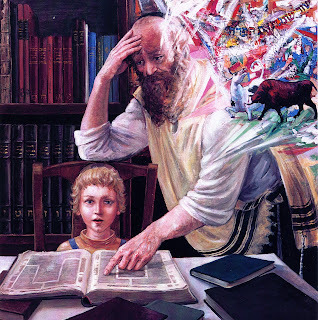 But Rabbi Yosef Yitzchak saw each new situation into which he was thrust as a provident opportunity, orchestrated with a demanding – if sometime unfathomable – deliberation. For him there was no such thing as default. Each new circumstance carried with it the weighty import of a Divinely ordained mission – it was his responsibility to set his own concerns aside and meet the need of the hour, however difficult. A new volume in the series of Chasidic discourses by the fourth leader of Chabad-Lubavitch, Rabbi Shmuel Schneersohn, covering the year 5642/1882, has just been released by the Kehot Publication Society. The year 1882 was a year of great upheaval for Russian Jewry. A large wave of anti-Jewish riots swept through south-western Imperial Russia from 1881-1884. In that period more than 200 anti-Jewish events occurred in the Russian Empire. During these pogroms, which continued for more than three years, thousands of Jewish homes were destroyed, many families were reduced to poverty, and large numbers of men, women, and children were injured. The "Tanya" is the central work of Chabad thought, a complete guide to the deep and often complicated relationship between man and G-d, instructing the "average" person every step of the way, foreseeing and forewarning all possible obstacles to his or her service of G-d. Written by the first Rebbe of Chabad it was first published in Kislev 5557 (the winter of 1797-8). The following is a collection of extracts from a letter of the Friediker Rebbe, Rabbi Yosef Yitzchak Schneesohn, describing the great importance, value and power of the Tanya. There is a difference between a Chassidic upbringing and a regular upbringing… even a religious upbringing. When I was a very small child, as soon as I began to talk, my father the Rebbe said to me, “Whatever you may wish to ask, you should ask me”. Although there were others who paid attention to all my needs, my father said, “Anything that you may wish to ask, you should ask me”. 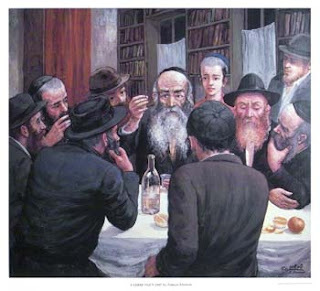 The popular COL (Chabad On Line) Hebrew language site recently posted four clips from a documentary that portrays the life led by the Chassidim of Kfar Chabad in the mid 1960’s. The film is titled in German “CHASSIDISMUS – ODER DER FROHLICHER WEG ZU GOTT” (“CHASSIDISM – OR THE JOYFUL PATH TO G-D”), however the narration is in English. The producer is identified as Kobi Jaeger, I don’t know he was but he seems to have a very good grasp of his subject, and in my opinion has generally succeeded in capturing the essence of the Chassidic ideal authentically and with an elegant simplicity, which reflects the purity of Chassidic life as it should be. These are beautiful camera shots of real Chassisdim, Davening, learning, Farbrainging and working, epitomizing the ideal of “be’chol derochecho de’aihu” (“in all you ways you shall know Him”) – joyously serving Hashem with every breath. Here you can really see the Chassidus of the Bal Shem Tov as persevered through Chassidus Chabad, so that it may be manifest in every aspect of the human experience. This Monday, the 26th of Shvat, is the twenty fifth Yhortzeit of Rabbi Yakov Landau, who served for fifty years as the Chief Rabbi of Bnei Brak. He was born in the year 5653 (1893) in the Chassidic town of Kurnitz, where his father, grandfather and great grandfather had served as Rov. He too took up that post upon his father’s death, which occurred before is twentieth birthday. He did so at the express directive of the Rebbe Rashab of Lubavitch, with whom he enjoyed a very special relationship. This week Hebrew language weeklies such as Ba'kehila and Hamodia published special articles or sections in his honor, and while I have not yet seen the Hamodia, the main focus seems to be on his activities as Rov of Bnei Brak. This post will focus on his years in Russia.